I LOVE fairytale retelling - I think I've read 10 so far this year! But I'm not in the challenge because I missed the sign up deadline. Sad faces. And Beauty and the Beast is my favourite fairytale f them all, so I'd love to read Uprooted! You can always leave a link there, so I can add it to the master sign-up post :)! I've always loved Rapunzel and its various versions - probably because I relate on the basis of long blonde hair :P I know it's not a book, but I adore the Tangled retelling. In terms of books, I loved Neil Gaiman's 'The Sleeper and the Spindle', a retelling of Sleeping Beauty. It was very interesting! Hmmm, het is niet echt één sprookje, maar ik heb laatst Kissing The Witch gelezen van Emma Donoghue en dat is toch echt wel een aanrader! Ohhh this is so cool! I've seen this book around the blogs (mostly on Waiting for Wednesday) and it looks awesome. Thanks for hosting this - and your birthday is a week before mine! :) (but I suspect I'm several of years older - I turn 28 this year). My favourite fairytales were Sleeping Beauty (the Grimm version, not the Disney one) and Thumbelina by Hans Christian Andersen - I love his fairytales! 24, so we're not THAT far apart ;) Thumbelina is a great tale. This giveaway is the best! My favorite fairy tale is Beauty and the Beast, I'm so excited for the new movie, starring Emma Watson but at the same time I'm not that sure how it will turn out because I watched Cinderella and it was only okay, not great. I haven't read that many retellings, though I'm in the challenge but I love The Lunar Chronicles, Cruel Beauty and Dorothy Must Die wasn't bad either. Eep, so sorry for slacking off with the challenge, Mel. I've been *reading* some retellings, but I've been crappy at reviewing them. :( And I haven't used the hashtag... I WILL START ASAP, THOUGH. This giveaway is amaaazing, Mel! No worries. There are no rules and there should be no pressure. This challenge is just for the fun :)! I've actually been eyeing Uprooted! I saw someone add it on Goodreads the other day and immediately went to check it out. :P Hopefully you enjoy it. I'm terrible at keeping up with challenges which is why I rarely join them. I was supposed to join one this year and read 50 books for something I can't remember, but I stopped keeping track and am way too lazy to go back. D: Alas. Wow, this is an awesome giveaway! 50 ARCs to European readers is so generous! I currently have an eARC of this one and it's really great so far; a bit wordy, but the prose is awesome :) I hope your winners will like it! Woah, this is such a fabulous and generous giveaway Mel! Congrats on being contacted by the publisher and I hope you have the best birthday ever, you deserve it girl! OMG HOW IS IT APRIL ALREADY. It's almost your birthday!!! yay yay yay do you have any special plans? And this is SUPER cool. I know Maggie Stiefvater already blogged about this book (well maybe I don't *know* that, I think it was her I first heard about it from...), and you're right, it IS perfect for your blog. 50 ARCs(!!!!!!!!!!!!!!!!!!!!!!!) for European countries. GIRL YOU ARE BECOMING SUCH A BIG BLOGGER, AND I LOVE IT. You deserve every bit of success. I just wanted to let you know that I entered your giveaway because I was SO EXCITED for this book. Then I went back and read that it's for Europe only, so I don't qualify. I'm really sorry for messing that up! I'm SO psyched for this book! I love Novik's Temeraire series and I've been patiently waiting for this book for AGES! My favorite retelling is Splintered by AG Howard, very well done. Or the Lunar Chronicles!! My favorite fairytale.. Probably Sleeping Beauty! I am so excited for this book! 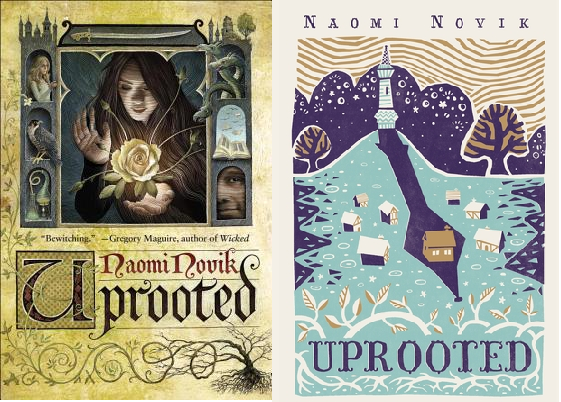 I love all of Naomi Novik's work, thanks for doing this giveaway. My favourite fairytale to read retellings of is Cinderella, but if mythology counts, I havea huge soft spot for the myth of Hades and Persephone. May I say I really like your blog? I've been following it since Bout of Books 11 read-a-thon and I enjoy your posts. My favourite fairy tale is "Beauty and the Beast" (the original tale), so my favourite retelling had to be Heart's Blood by Juliet Marillier (and since I read it, I've loved everything Marillier writes).